Laminated, these 8.5″ by 11″ references are both durable and easy to store ready for years of use. You won’t find these anywhere else as they are designed, printed and laminated by myself. Then pendulum offers a world of options with it’s flexibility and size. To truly unlock its potential, it is necessary to practice, practice and then do more practice. 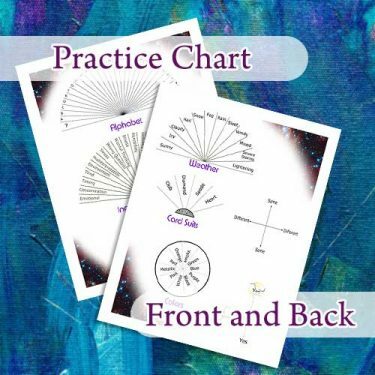 This chart features charts specifically aimed to help you hone your skills. 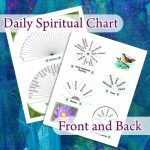 It comes with a handy guide with example practice exercises to take with you on your pendulum journey. Use this chart to practice your skills by dowsing upcoming weather. Apply this simple chart to a world of dowsing options. Turn average playing cards into a pendulum exercise. Many prefer using a chart to begin receiving yes/no answers from your pendulum. Great memory aide. If your answers are lacking accuracy, this chart helps you figure out why. For prediction or practice, this chart helps to make colors easy. This chart is designed to give you optimum flexibility, with minimum complexity.